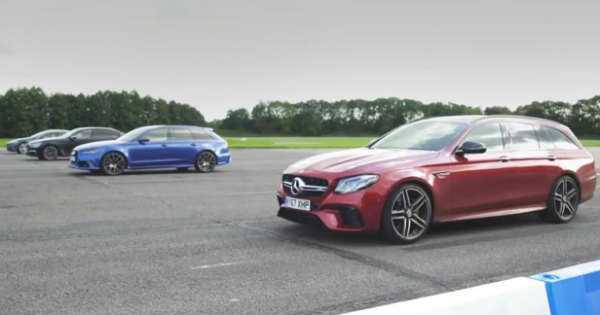 High Performance Cars Drag Race: BMW M760Li v Tesla Model S v Audi RS 6 v Mercedes-AMG E63 S! - Muscle Cars Zone! With the blooming of the car industry lately, car manufacturing companies are making some of their best and most exclusive vehicles ever. These high performance cars make the customer wish for more and more as soon as the latest model is released. Hereby, we take a look at this video and see which one of these four high performance cars is the best and fastest one. The host is in the mighty Mercedes AMG 63 S Estate. Then we take a look at the furious Audi RS 6 Performance, followed by the German pride, the BMW M760Li. Our final car on the track is none other than the Tesla Model S P100D. Before the start of the race we listen to the amazing sounds each car make as it revs its engine. But then it is time for the real fun and all four high performance cars in a sudden blow are seen speeding across the track. At the start all four cars seem to be near one another, but then the power of the Tesla Model S P100D is unleashed. It continued going super fast, thus increasing the advantage, and eventually finishes the race in first place in just 11 seconds, followed by the V8 Mercedes AMG finishing it just for 11.2 seconds. The BMW is third crossing the finish line in 11.3 seconds and finally the Audi finished the race in 11.4 seconds. The race looks absolutely amazing and hereby you must check out every second of it! Finally, if you are in for more thrilling action, follow this link to watch a Tesla, Porsche and Audi drag racing!